With the Christmas and New Year lull out of the way, I thought I would resume with the weekly round-ups of what's been happening in Greenwich. 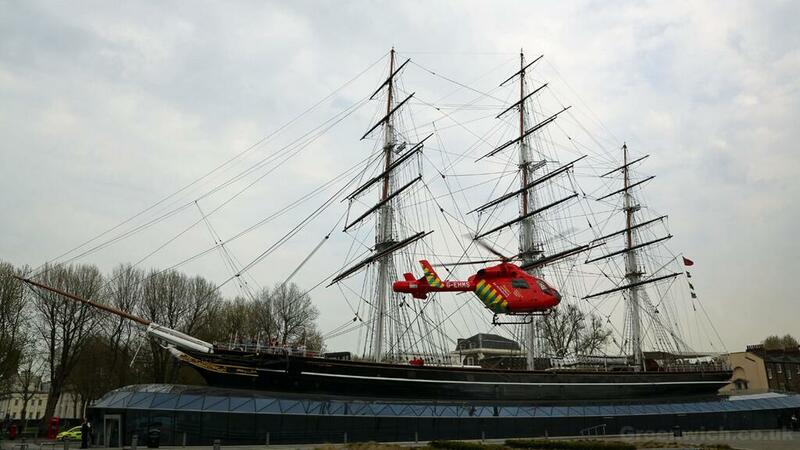 London's Air Ambulance service has been marking its 25th birthday - and trying to raise funds for a second helicopter - so it gave me a good chance to post on twitter this picture I got last year of the helicopter next to the Cutty Sark. Here's some information about how you can support the service. It's also been a week of local anniversaries. Last Monday, it was 108 years to the day since the rather wonderful Woolwich Town Hall was first opened by Will Crooks MP. 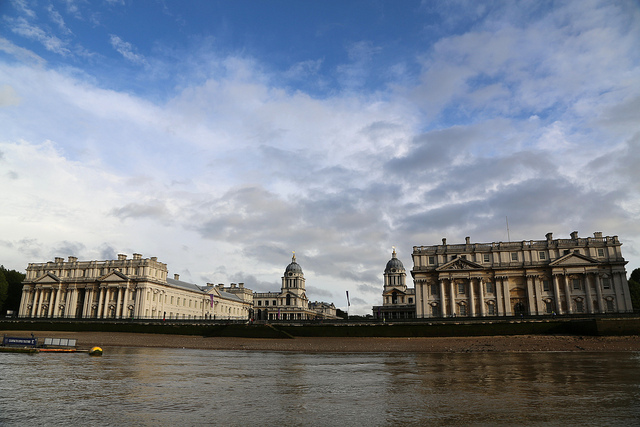 On Thursday, it was the 141th anniversary of the order that first established the Royal Naval College at Greenwich in buildings that had been left empty since the Royal Hospital for Seaman closed. Those anniversaries come from Dave Male's Greenwich Day by Day, reproduced on the Greenwich Guide website. Information has come, via a Port of London Authority notice to mariners, that work will soon begin on the swing bridge across the mouth of Deptford Creek. Contractors are expected to begin work around the 11th February and the project should take nine months to complete. I've put more information on the forum. Also on the forum is a query from new user Dan who has noticed a number of properties going on the market in Christchurch Way. 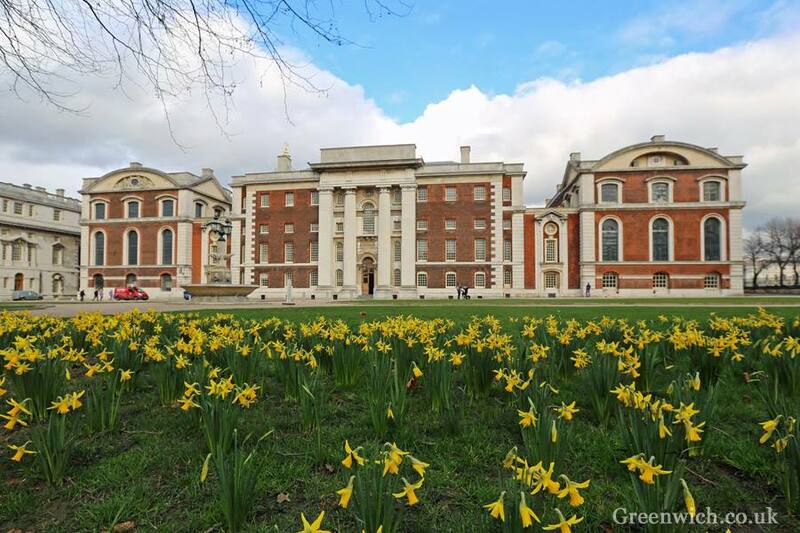 If you have a question or something to say about Greenwich, it's easy to register and start a discussion. You may have heard that HMS Argyll is currently up in the Upper Pool of London, moored next to HMS Belfast. 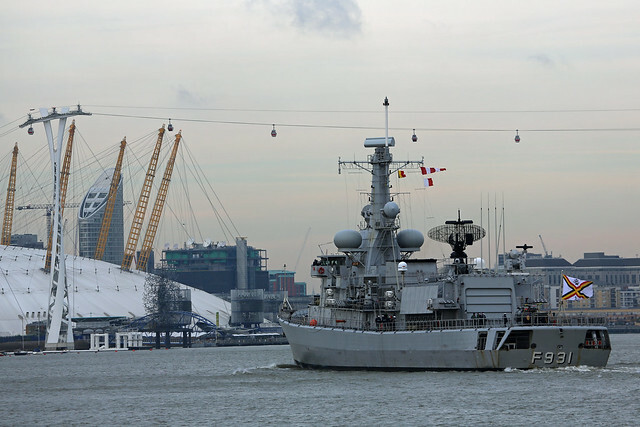 The Type-23 frigate quietly made her way up river on Wednesday morning, passing Greenwich about 1am. She departs on Sunday afternoon, shortly after 4pm, so there's a chance to see her sailing by. It will be after sunset but there should be enough light to see her - expect her to pass Greenwich at or shortly after 4.30pm. 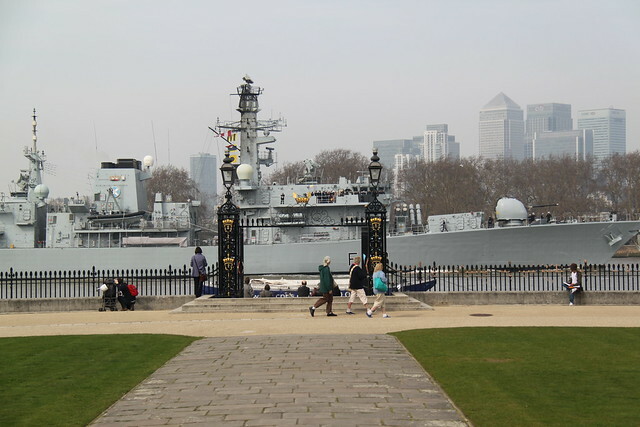 Here was her sister ship HMS St Albans passing the Old Royal Naval College a few years ago. On Tuesday evening, Rev Chris Moody from St Alfege Church will give a talk to the Greenwich Historical Society under the title Hawksmoor and the Commissioning of the New St Alfege. Non-members are welcome but there's a £3 admission charge. If you know of a community event coming up, you can add it to the website's What's On section using this page. As well as appearing on the website, this round up goes to many hundreds of subscribers via email. If you would like to receive it in your inbox, you can sign up here. 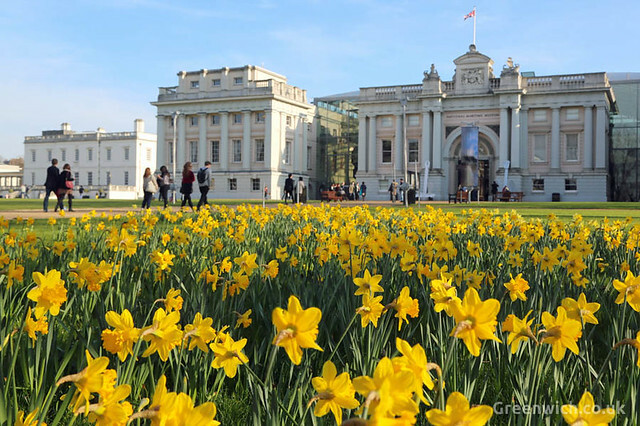 A day later than normal, here's a round up of some of what's been happening in Greenwich this week. The Standards Committee of Greenwich Council convened on Friday at Woolwich Town Hall to examine the now-famous voicemail left by the leader of the council for his colleague, John Fahy. Their decision was published on the council's website on Friday afternoon. If you have a free community event coming up, you can add it to the website here. Last Sunday I was selling my Greenwich and Thames calendars at St Alfege church hall after the Sunday morning service and £47 was raised for the restoration fund. Thanks to everyone that has bought one, whether it was online or in local shops. It's been fun to do it again and they've proved to be pretty popular. 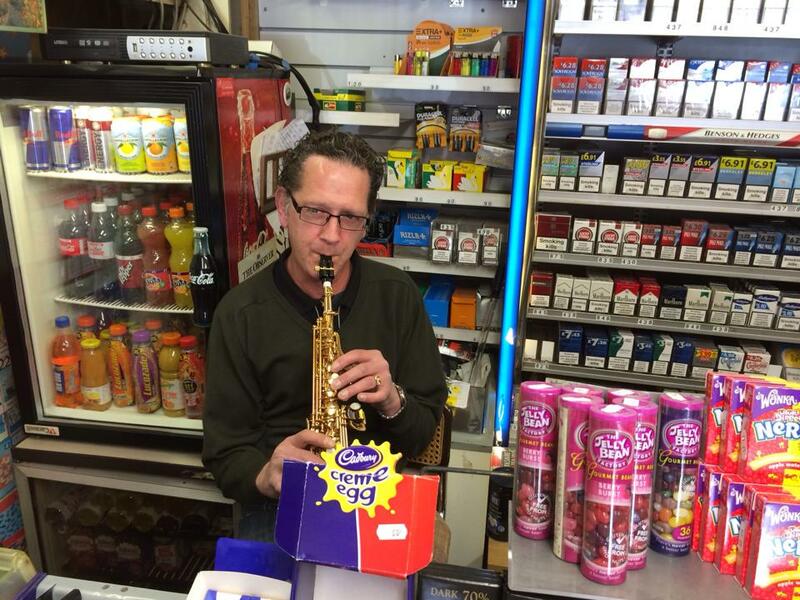 If you'd still like one before Christmas, they're available in shops and cafes across SE10, SE7, SE9 and SE18. So all that's left to do is to wish everyone a Merry Christmas! Here are a couple of Christmas videos that I made last year. 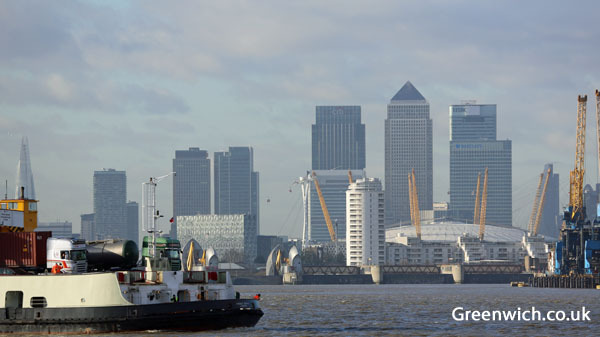 Greenwich.co.uk is giving away two of the Royal Greenwich calendars that have been created for 2014. 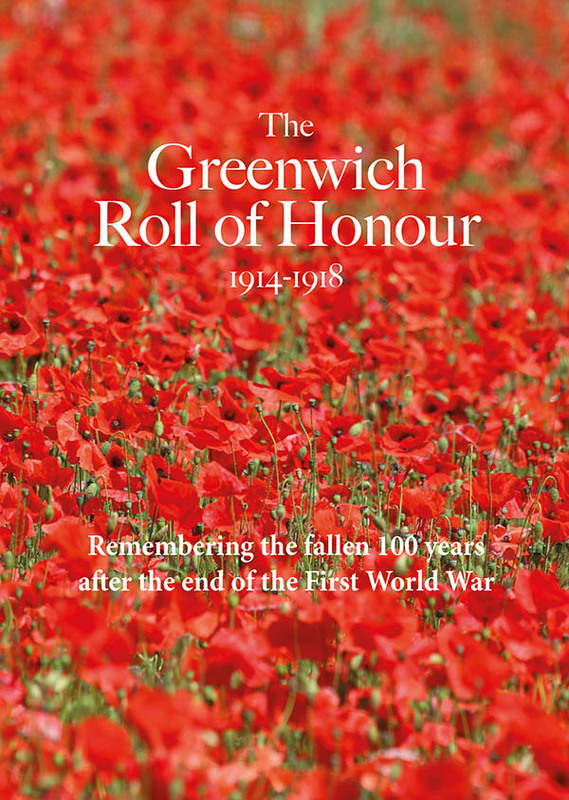 The calendar features images from around the borough with Greenwich, Charlton, Woolwich and Eltham all represented inside. It costs £6 and is available in local shops and online. To be in with a chance of winning a free copy of the calendar, all you need to do is send an email with the name of the tall ship that appears in the month of May in the calendar. Once you know the answer, simply email it to rob@greenwich.co.uk and put "competition" in the subject line. The closing date is noon on Friday 13th. It will be unlucky for some but lucky for two others when I pick the winners at random from the correct answers. If you win, the calendar can be sent to you or to someone else if you'd like to give it as a Christmas present. Helpful tip: all the pictures, along with descriptions, are shown on the website through which they're being sold. UPDATE - Winners were Kevin and Sarit. Local ward councillor Matthew Pennycook has been successful in his bid to become Labour's parliamentary candidate at the next General Election which will be held in 2015. He won the selection battle in a ballot of local Labour party members held at the Woolwich Grand Theatre last Saturday. When I hear of other parties selecting their candidates, I'll no doubt share that news too! 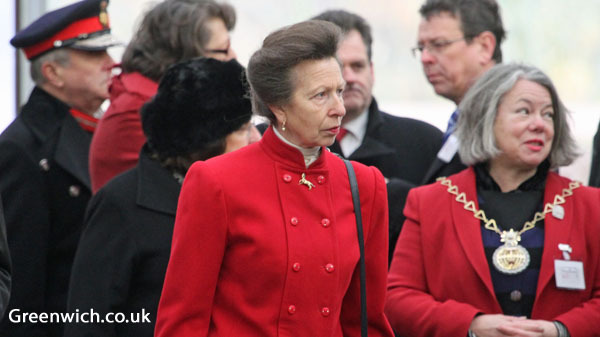 The Royal Borough received a royal visitor this week when Princess Anne officially opened the equestrian centre that has been built on Shooters Hill next to Woodlands Park Farm. The equestrian centre is run by Kent-based Hadlow College - here's some photos from when I had a look around last year. 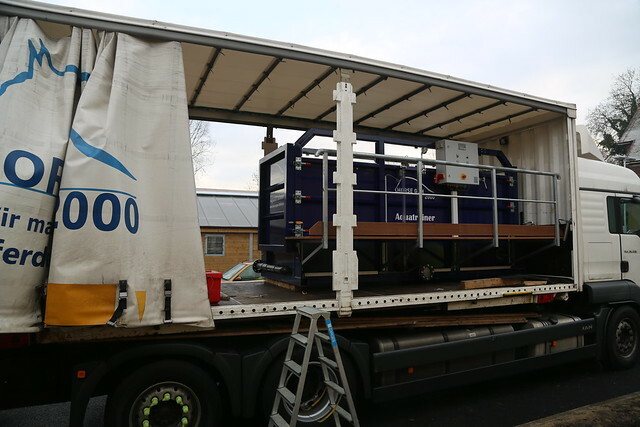 London's flood defence system was called into action in the early hours of this morning and then again this afternoon to protect the capital from the risk of a very high tide. 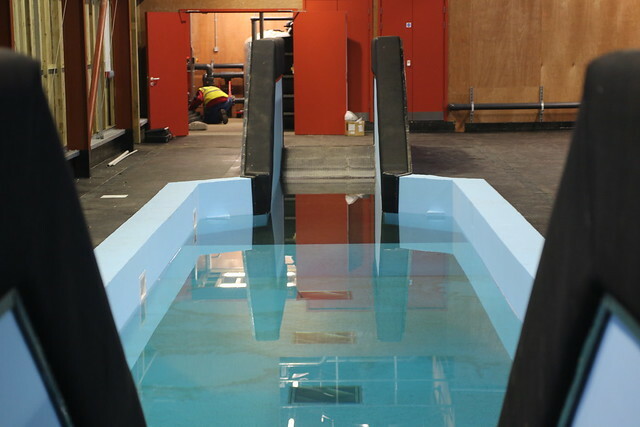 It was the first time that the barrier has been fully closed this year in response to flood risk and in doing so it protected London against the highest tides since it was completed in 1984. Luckily towns further down river that had been warned of potential flooding seemed to have got off lightly. Here a picture from this afternoon's closure with one of the Woolwich ferries just coming in to view. Much loved Charlton Athletic match reporter Kevin Nolan has a new sponsor! Grant Saw Wealth Management, based up at the Blackheath Standard, are backing Kev which means there will be lots more top quality, witty sports writing from Kevin over the rest of this season. I have again been trudging across the borough armed with a box of calendars and a invoice book doing my best impression of a contestant on the Apprentice. After getting them into the National Maritime Museum last Friday, this week I have restocked shops like Pegga at Blackheath Standard, Warwick Leadlay by the market and also taken a new delivery to Lizzie's lovely cafe in East Greenwich Pleasaunce and also to Charlton House. They are, along with my River Thames calendars, available online too. Speaking of the Pleasaunce, the Friends of East Greenwich Pleasaunce, along with the Bridge community centre, are bringing Santa to the park in East Greenwich this Sunday. From 1pm-3pm, there's a Winter Barrow sale, a chance to meet Father Christmas between 2pm-4pm (I heard the real one is coming which is something of a coup) and there will also be carols from the Halstow Community Choir during the afternoon. There will also be carols on Monday 9th December at Mycenae House excerpts from Scrooge performed by the Mycenae Players. Free entry with a retiring collection in aid of Epilepsy Action. You can keep an eye on other upcoming events here. If you were near the river on Friday morning you might have seen this warship go past. The Belgian frigate BNS LOUISE MARIE went up to moor alongside HMS Belfast and took with her some sacred soil from the battlefields of Flanders. The soil will be taken through London tomorrow by the Kings's Troop Royal Horse Artillery and it will eventually be added to a WWI memorial garden. With it being December 1st on Sunday, it means the start of this year's St Alfege Advent Windows. I'm sure you know what it's all about by now but 24 homes local to St Alfege will be each unveiling their "window" throughout December. Keep an eye on the to see where the windows are! I don't think there will be many places in Greenwich doing a BBQ this weekend, but one place that will be is the Greenwich Ecology Park on Sunday. They're having their Wild Winter Fayre where there will be wintry wildlife quiz trails for children, barbecue and winter warmer drinks, plus gift and second hand book stall. Full details are here. 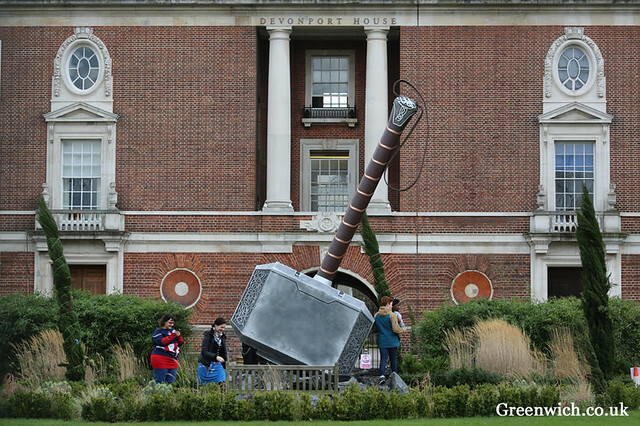 Did you go and check out the art exhibition at Rushgrove House in Woolwich last weekend? As I mentioned in the previous round up, it was a rare chance to look inside this hidden gem near the barracks. There were lots of great pics floating around on social media - do check out this great set by Chris Mansfield on his new (brilliant) Historic Woolwich Facebook page. 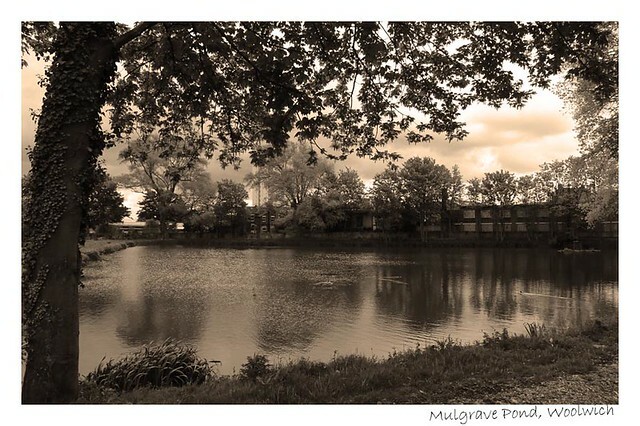 In the grounds of Rushgrove House is Mulgrave Pond and here's a photo I took of that earlier in the year. Fans of CAFC match reporter Kevin Nolan can rest easy: a new sponsor has been found and we look forward to unveiling them on the site for the first match of December. In the mean time, why not look back at Kev's reports of the season so far. The Cutty Sark has announced a series of shows which will take place in its 85-seater studio theatre. The performance space in the lower hold will welcome acts such as Alan Davies, Ross Noble, Richard Herring and even Sir Robin Knox-Johnston early next year. Full details of that are on the forum. 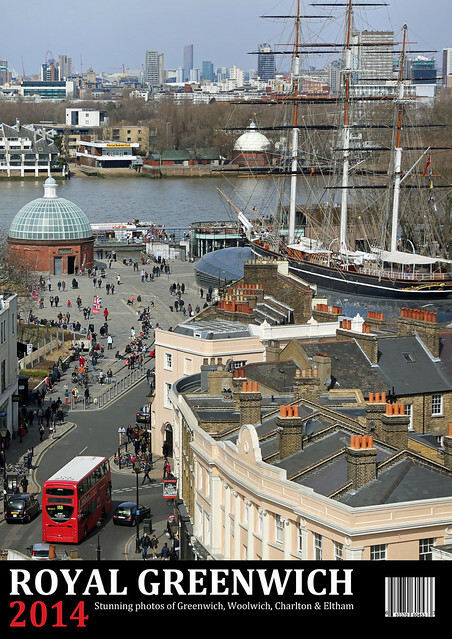 The Cutty Sark, as seen from the tower of St Alfege Church, features on the front cover of the calendar I've made. I was lucky enough to go up in the tower twice this year, once as a dry run just to get a look at it and then again in London Marathon day. It was a great privilege to be allowed to go and there's a photo from both visits in the calendar. I am very pleased that the Greenwich calendar, along with my one about the River Thames, will both be stocked very shortly by the National Maritime Museum gift shop, as well as lots of other shops around the borough. Full details about both and where to get them are on the website. Oh, and staying with the National Maritime Museum - who have just announced Sir Charles Dunstone as their new Chairman, by the way - there's a free event next Friday afternoon called "Caricatures and Yinka: Life, Love and Laughter." Thanks to the NMM for adding it to the What's On section of the website - you can advertise community events on there too! 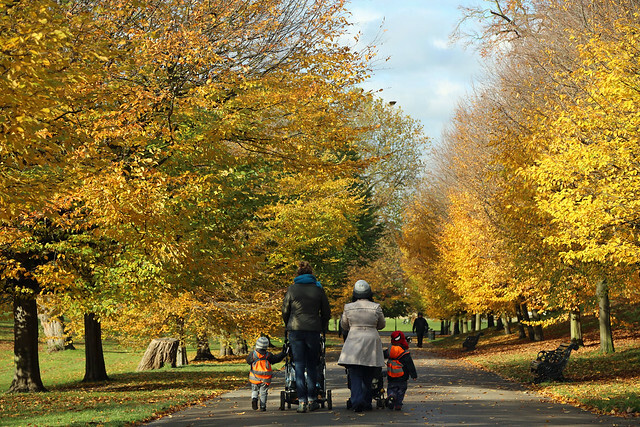 I thought I would kick off this Weekly Round Up with a photo I took of autumnal Greenwich Park on Tuesday morning. Always good to be out and about with the camera although I did forget to check out the Old Royal Naval College where at the start of the week, a new version of Cinderella joined the incredible list of films that have used it as a set. Such is the popularity of the stunning ORNC that Empire magazine recently asked it was the most popular filming location in the world. 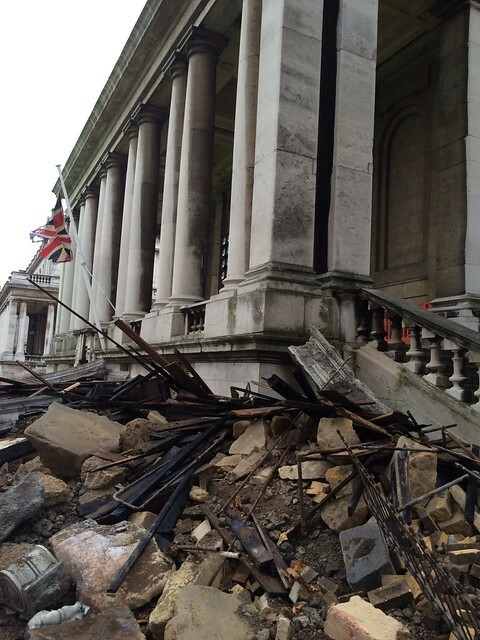 Another location in the borough to be used for filming recently has been Rushgrove House in Woolwich. This Georgian mansion is tucked away near the Royal Artillery barracks and it was used in the summer as a set for Mike Leigh's new movie about JMW Turner, starring Timothy Spall. There will be a rare chance to see inside the property this weekend as it will be one of the venues for an exhibition by students from the Royal College of Arts. If you'd rather see the works of Turner, it just so happens an exhibition of his marine art has just opened at the National Maritime Museum. Historian, and councillor, Mary Mills has had a first look at a new book called Greenwich Revealed. The book is an investigation in to some early 18th century line drawings of Greenwich. It "may be the most important book written about 'West' Greenwich," commented Mary on Twitter. Written by much-respected historians Julian Watson and Neil Rhind, it's available now in Warwick Leadlay and Sabo's newsagent, priced £10. It hasn't been a very busy week on the Greenwich.co.uk forum but there's been some more posts to the forum thread about the proposed hotel where Trident Hall currently stands, including details of a petition. Speaking of petitions, Stewart Christie has just started one to try and win support for the idea of protecting the Woolwich Grand theatre by getting it listed as an asset of community value. This is as a response to a developer's proposal to replace it with flats. 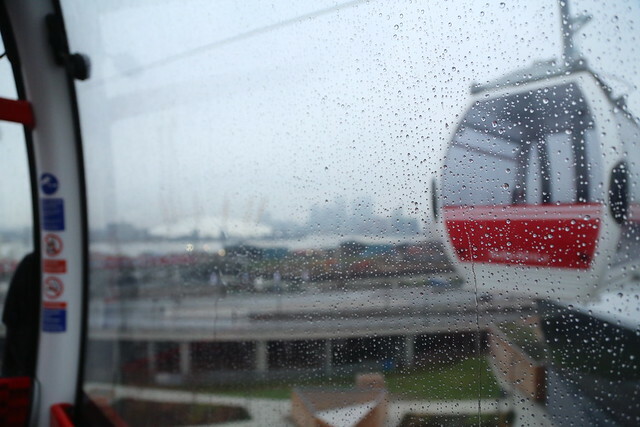 Snipe had a bit of a scoop this week when it revealed that the cable car is down to just four regular commuters. The story got picked up by plenty of other news outlets, too. As part of the big development called the Movement behind Greenwich High Road and Norman Road - which is made up of new flats, student accommodation, a hotel and more - there has been extension provided for West Greenwich House. Local residents are invited to go and see the completed extension to the community centre on Monday, between 3pm and 7pm. It wouldn't be one my weekly round ups without a plug for my calendar. This week I delivered some copies to the lovely Avery Hill Park Cafe, which means it's now finally on sale in all of the postcodes that are pictured inside: SE10, SE7, SE18 and SE9. You can get it online or see all the stockists here. In a new feature on Greenwich.co.uk, I'll round up some of the interesting content that's appeared on the site over the past week and elsewhere on the web. News emerged early in the week that the Swedish giant IKEA are eyeing up the Sainsbury's and old Comet on the peninsula. Sainsbury's already has plans to move to Charlton but would the popular flat-pack furniture store prove too popular for the already busy roads? There were mixed opinions in the debate that followed. Greenwich Park sadly lost four trees in the storms of Sunday night and it was closed for most of Monday while Royal Parks assessed the damage. The howling winds and driving rain was a big change from a few days earlier when the park was looking stunning in the autumn sunshine. 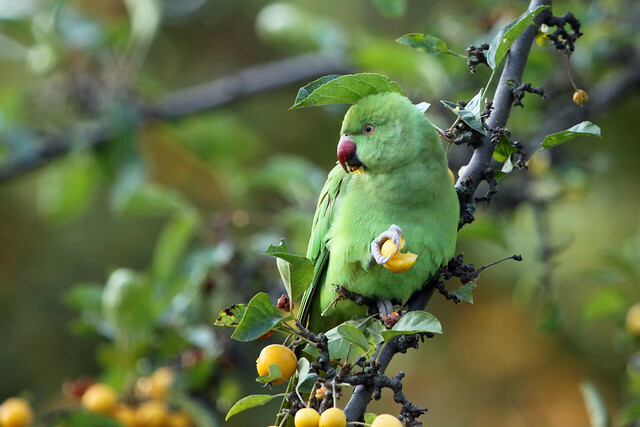 I posted up a set of autumn pictures from the park and I also got lucky when I found some beautiful parakeets who were happy to pose for my camera. A new Friends group for the Greenwich and Woolwich foot tunnels was established recently under the acronym FOGWOFT. The new group, chaired by Mary Mills, has had a meeting with the council and released details of a new timetable for the works that need to take place in the river crossing to be finally, hopefully, completed. The full press release from the group is here. Also on the forum, discussion has continued in a long running thread about the impact of the changes that will happen for train passengers on the Greenwich line after 2014. If you're not up to speed yet, do take a look. More stockists coming soon! My other calendar for 2014 is all about the beautiful ships and boats to be found on the Thames and features a lovely picture of a tall ship passing the Old Royal Naval College with fireworks overhead. Kevin Nolan continues his superb match reports for the site and this week he covered the Addicks' nil-nil draw at home against Wigan Athletic. "This earnestly contested stalemate featured Charlton’s third consecutive clean sheet, an achievement which eluded them during their first ten league games. With a paltry total of nine goals so far, only three of them scored at The Valley, it’s just as well they’ve defiantly clamped down at the other end. Their spirit might be bruised but remains unbroken." Click here to see the full report. We're still trying to find a CAFC-loving business to sponsor Kevin's columns and an intriguing suggestion for some fan-funding appeared in the comments section on that report. The Court of Appeal ruled this week that Health Secretary Jeremy Hunt did not have power to implement cuts at Lewisham Hospital in south-east London. Greenwich Council's cabinet member for Health, Cllr John Fahy, welcomed the news in a tweet: "Good news about the Appeal Court decision on Lewisham Hospital. Well done to the hard work of campaigners. Time to look to the future." As this is the first of these weekly round ups, I will take the minor liberty of going back slightly further than a week to recommend a look at this recent set of pictures I posted with photos from inside the glorious Woolwich Granada building - now owned by the ChristFaith Tabernacle church - and also some great images from the Heritage Centre showing how it looked when it opened over 70 years ago. The Greenwich Series - a live event at the Greenwich Tavern where interesting speakers get five to ten minutes to tell their story - returns on Monday, as it does on the first Monday of every month. There's more details here and you can keep an eye on more upcoming events on our What's On page. If you're involved in a local community event, why not add the details. 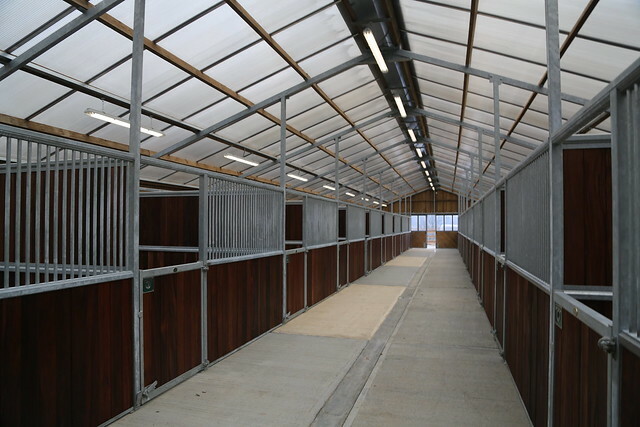 A NEW equestrian centre on Shooters Hill is nearing completion. 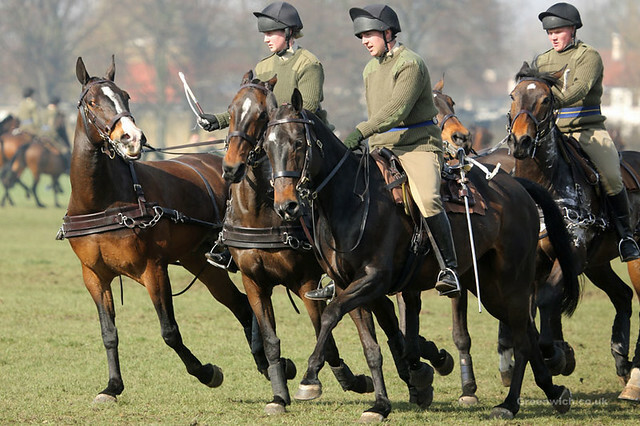 The facility will be run by Hadlow College and offer a range of equine courses for various age groups, including degree courses in partnership with the University of Greenwich. Surface material donated by London 2012 - it had been used in Greenwich Park. The facility will also host a new therapy centre where horses can be referred to by vets and one of the only equine baths available in the south east. 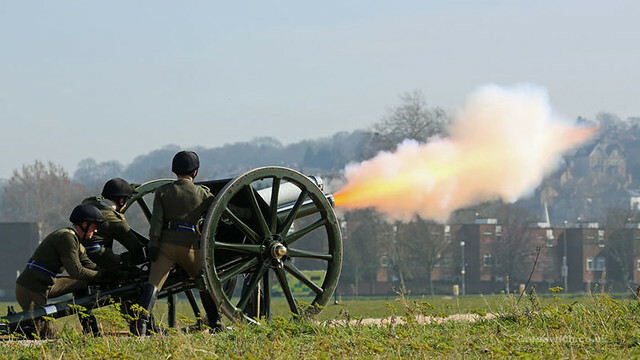 Surface sand used at Shooters Hill has come from Greenwich Park. 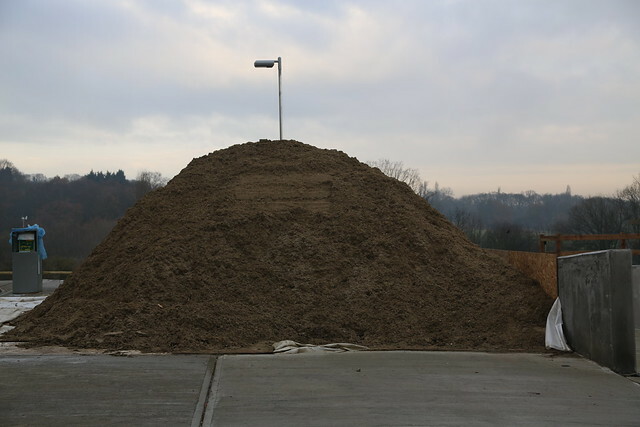 It made up about 1/80 of the surface material using in the park this summer and has been donated by London 2012 organisers. Hadlow College's Derek Payne told Greenwich.co.uk there had been an uplift in interest in equine courses since London 2012. "Especially on the equestrian sport side, for people that want to start riding or take it more competitively. Many had been looking at it for leisure but now are thinking more seriously about it as a career," he commented. A new "pegasus crossing" outside the equestrian centre will allow horses to cross the road in to Oxleas Wood. The press were invited to see the new equestrian centre and also the new "sports hub" at Hornfair Park on the day that the council launched its Legacy Report. The report, which is available to download here, outlines the benefits that the council claims the area has received through its role as a host borough.